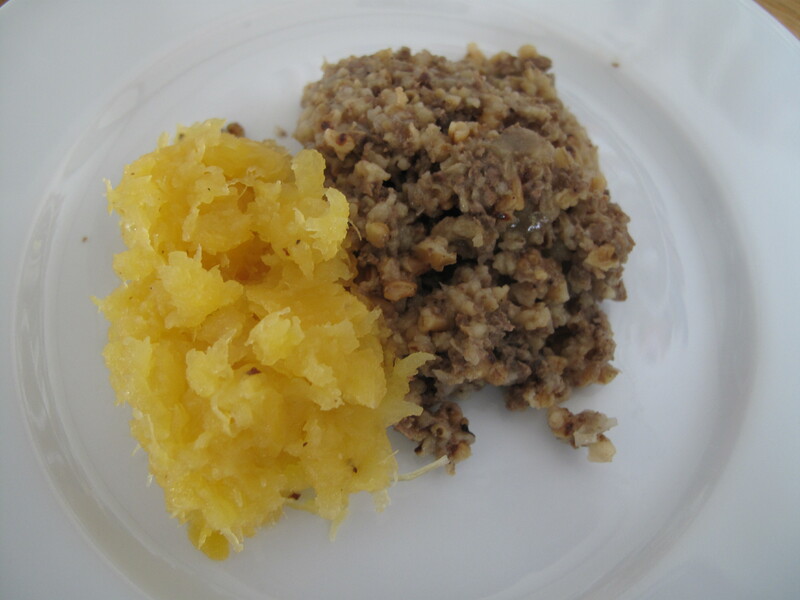 I wrote about the making of this haggis on my blog in June 2012. Then, I made the recipe using all sheep ingredients; it was strong and pungent, which I liked, but it was a bit too much for some of my audience. Next time I would try using some of the suggestions Meg Dods gives for toning it down – certainly substituting lung for kidney, sheep suet for beef suet, and the sheep stock for almost any other stock I might have to hand. The alternatives are clearly marked below. Clean the pluck in cold water, pierce the heart and lungs with a knife, and boil it whole in a large pan of water for half an hour. Allow the windpipe to drape over the side of the pan, and place a smaller vessel underneath it to catch the foam that will drip out of it as the pluck heats and cooks. After 30 minutes, remove the pluck from the pan. Cut the liver in half and return one half to the pan to cook for a further half an hour. Meanwhile, you can mince (by hand or in a food processor) the large onions, suet, cooked heart, the half of the liver that is ready, and as much of the lung and other parts of the lights as you want, removing and discarding any hard or black-looking parts. As each element is ready, spread it out on a large board. When the second half of the liver is done, mince that and add it to the rest. Add the scalded shallots. Now prepare your stomach bag or bags: sew up any gaps in the narrower end to make a secure pouch ready for stuffing. Get your needle and thread ready for the next stage, with a long length of thread. Strain and measure out your stock and squeeze your lemon. Strew the toasted oatmeal over the other ingredients, add all of the dry seasonings, and lightly turn everything over with your hands to mix. Take your pouch and stuff it with the mixture, using your hand. When it is a little over 3/4 full, pour in the stock and lemon juice, then sew it up along the long side. Do not over-fill the bag: the contents need room to expand during cooking. Place your haggis in a large pan of water, and pierce it a few times with a long skewer to prevent it from bursting as it cooks. Take the whole haggis to the table, recite an appropriate poem, and pierce its skin with a knife. Spoon out the contents. Serve with boiled or steamed turnip (swede – the orange one) mashed with butter and black pepper, and mashed potato if you like. Whisky is permissible as an accompaniment, though I’d advise against pouring it into the haggis itself. Drink a toast to the haggis and yourselves. Enjoy. Glad you enjoyed it – haggis isn’t everyone’s favourite but Burns Night is coming up, so it’s a topical moment to check it out! My photographs of haggis making have just been licensed by Magilla Entertainment for use in their forthcoming TV series Edge of America. 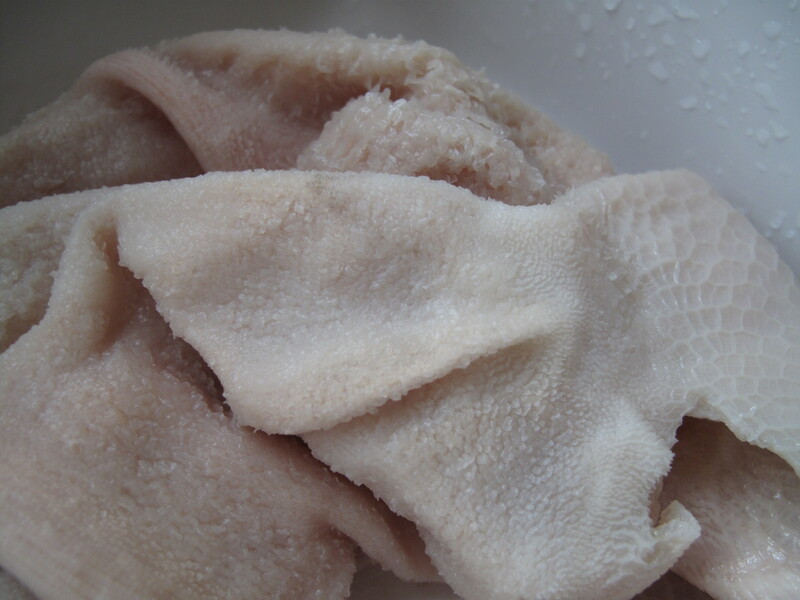 It seems it is even more difficult to get hold of all the basic items of sheep offal in the USA than it is in the UK, so my pictures will be the means of taking the whole process right back to basics for the American audience!